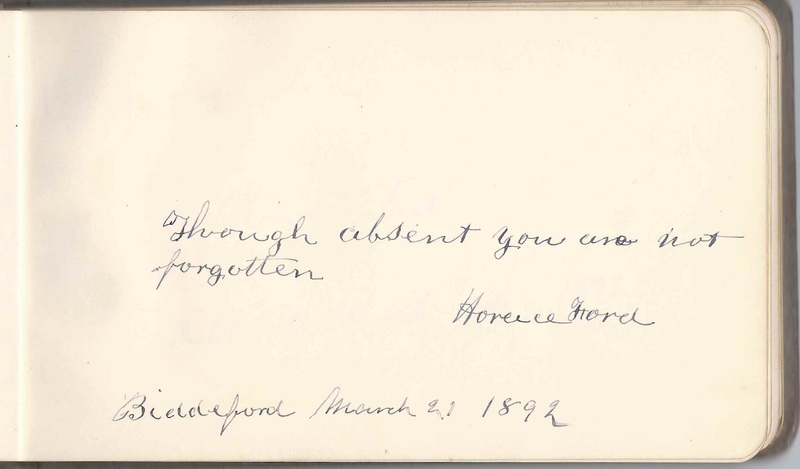 1890s autograph album of Mabelle C. Ford of Biddeford, Maine; some pages were signed by her classmates at Biddeford High School. 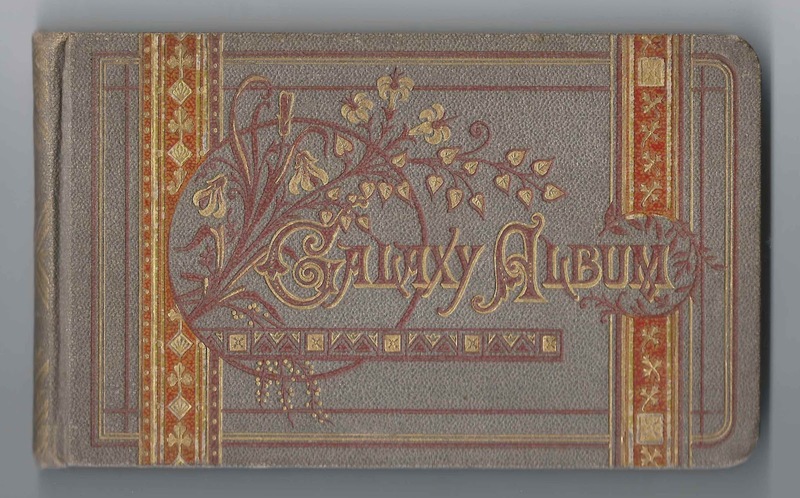 The album is approximately 7" x 4-1/4" and contains the sentiments of 40 of Mabelle's relatives, friends, classmates, at least one teacher and a Vice Deputy US Consul to Italy. An alphabetical list of the signers, and any supporting information, appear at the end of this post. 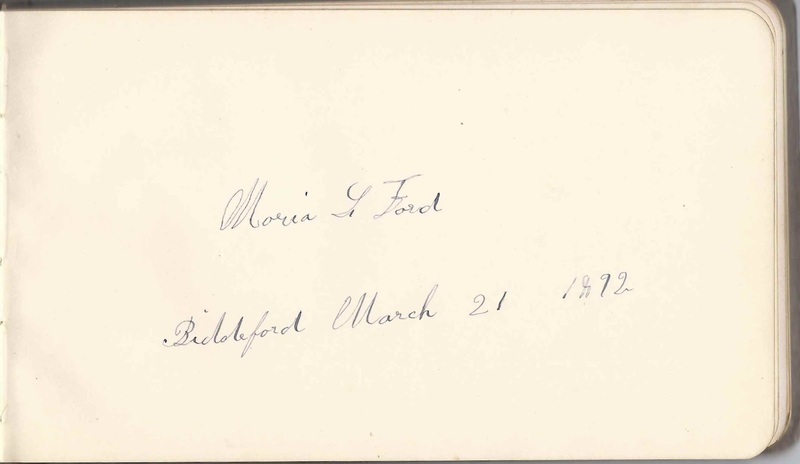 Mabelle C. Ford was born 28 March 1880, the daughter of Radcliffe H. and Constance H. (Littlefield) Ford of Biddeford, Maine. For a brief period, the family moved to Nova Scotia where Radcliffe was the U.S. Consul. Mabelle was a teacher; I don't believe she ever married. She died in 1969 at Old Orchard Beach, Maine. Mabelle's mother and paternal grandparents signed pages in her album. 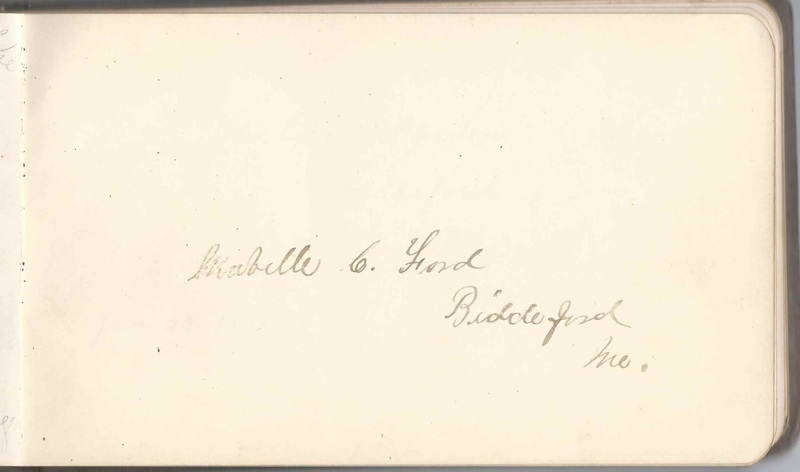 Her mother, Constance H. (Littlefield) Ford, signed one of the pages with a preprinted illustration. 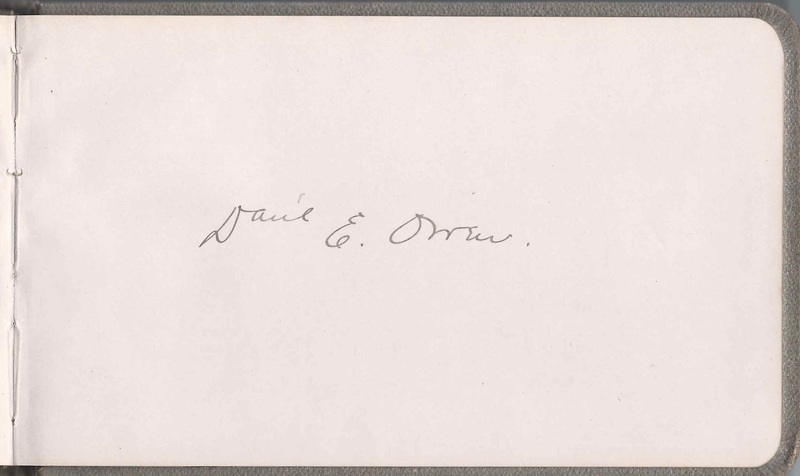 Mabelle's paternal grandparents, Horace and Maria L. (Davis) Ford signed pages in 1892. 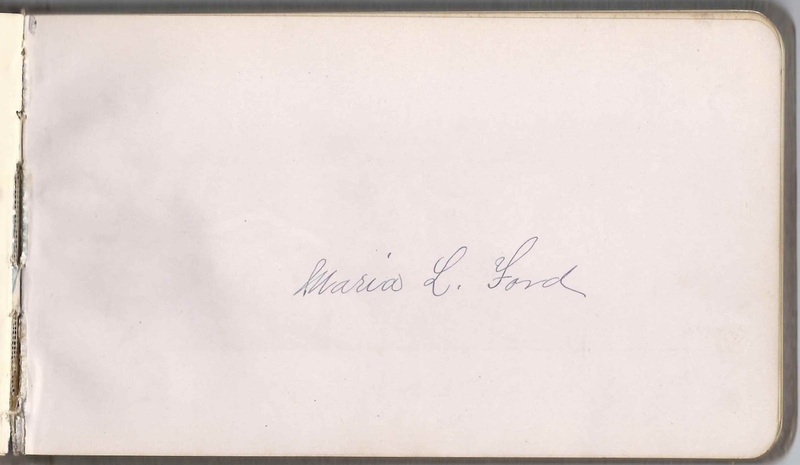 Another page was signed by a Maria L. Ford, possibly the same person as above, though the handwriting is different. Mabelle's mother Constance H. (Littlefield) Ford had a sister Annie G. (Littlefield) Owen. 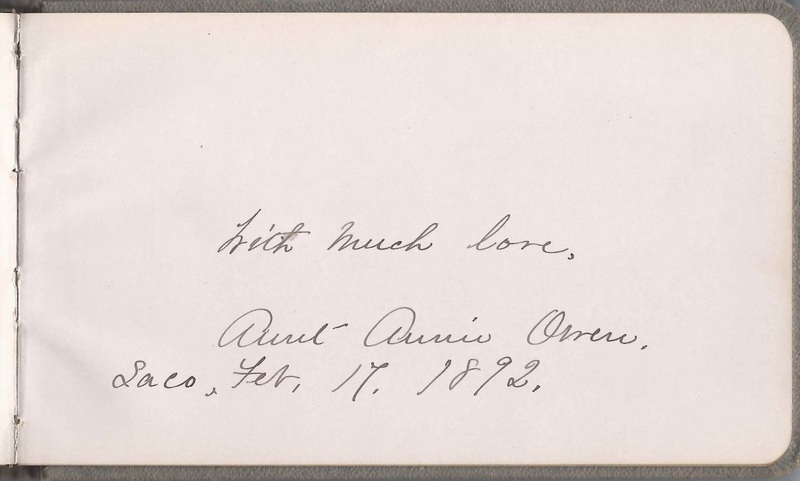 Annie signed a page at Saco, Maine, in February 1892, as did her husband George F. Owen and their son Daniel E. Owen. 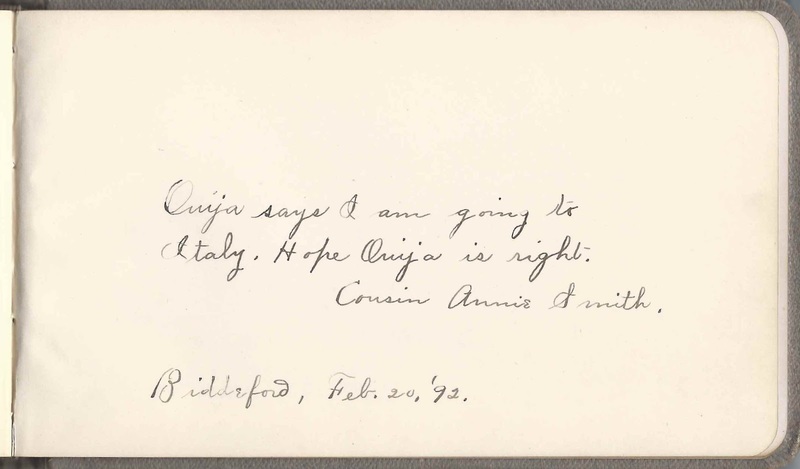 Mabelle's cousin Annie Smith signed a page at Biddeford, Maine, on February 20, 1892 and referred to a possible trip to Italy. 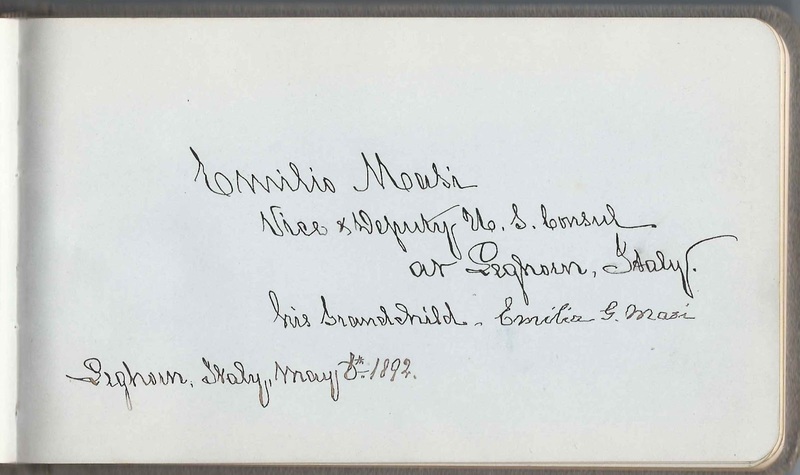 That possible trip might explain why Emilio Masi, Vice Deputy U.S. Consul to Leghorn, Italy, signed a page on May 6, 1892. 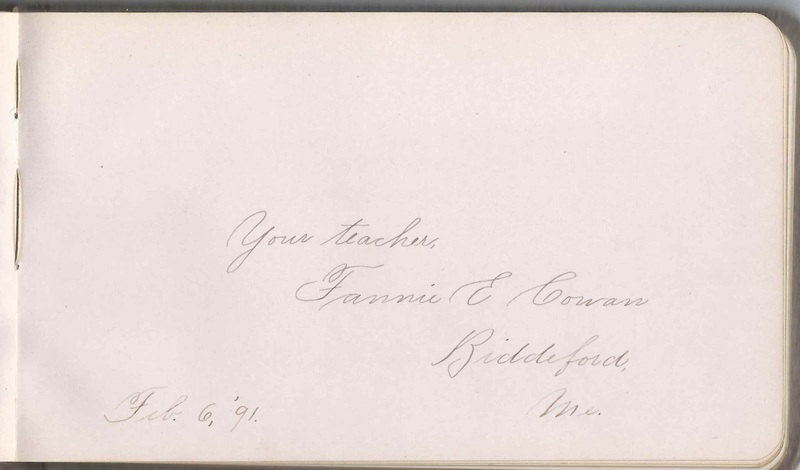 Mabelle's teacher Fannie E. Cowan of Biddeford, Maine, signed a page on February 6, 1891. If you have corrections to the information above or information on any of the signers listed below, please leave a comment of contact me directly. 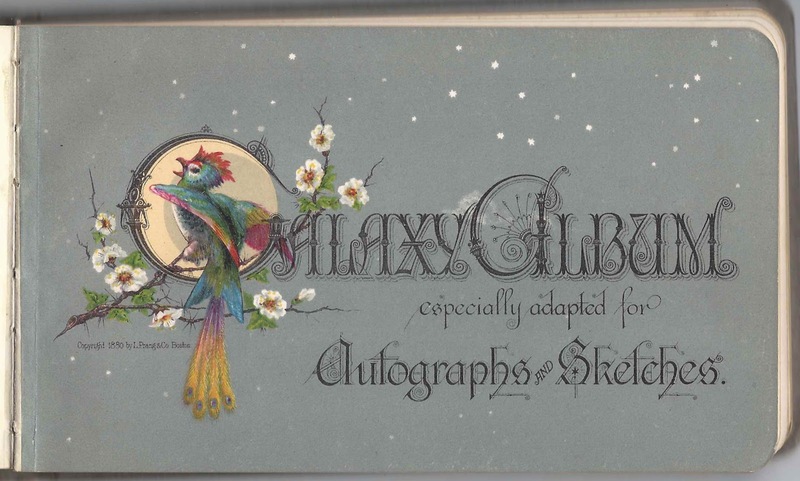 Lillian Davis of Clarence, Missouri, signed at Biddeford, Maine, on August 24, 1890; her father Durborn Davis signed the left facing page. (Their handwriting looks identical. 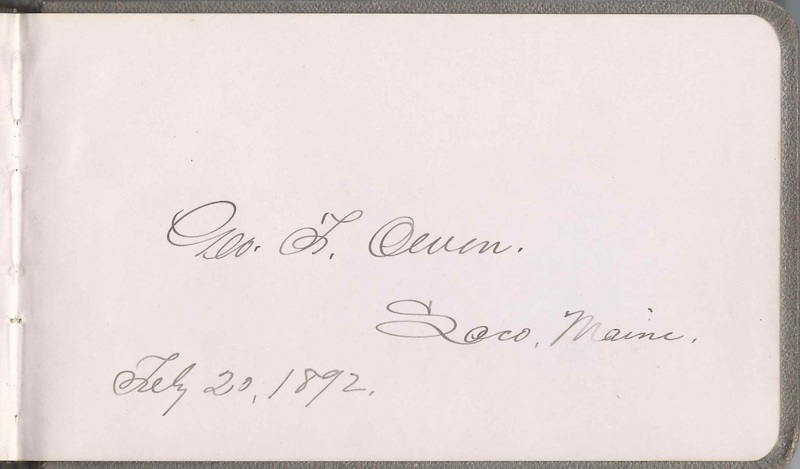 Aunt Annie Owen, signed at Saco, Maine, on February 17, 1892; she was Annie G. (Littlefield) Owen, sister of Mabelle's mother Constance H. (Littlefield) Ford. 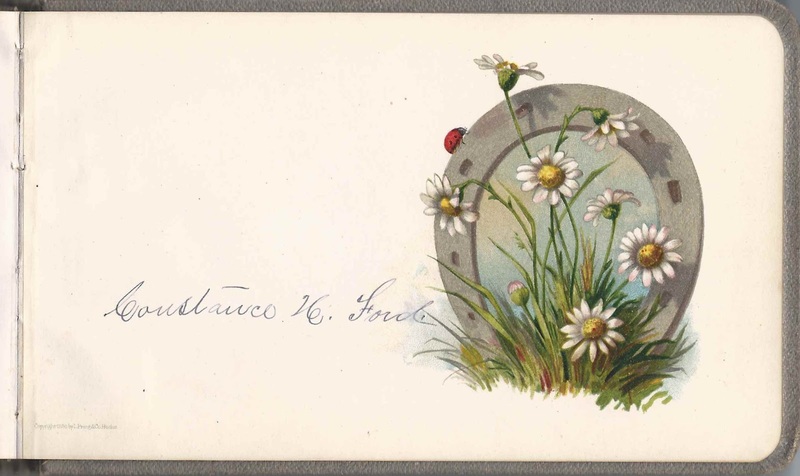 Annie Smith, signed at Biddeford, Maine, on February 20, 1892; Mabelle's cousin. "Ouija says I am going to Italy. Hope Ouija is right." Perhaps both Mabelle and Annie went to Italy, which would explain the page signed by Deputy US Vice Consul Emilio Masi.